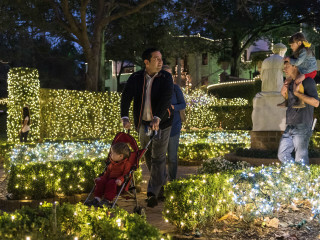 For the fourth year, the Museum of Fine Arts, Houston, brings holiday cheer to the 14-acre estate with a trail of lights, carolers, a hand-crafted model train, animated projections, and festive activities for all ages, including a cotton snowball toss, reindeer games, and sledding on a faux-snow slope. Visitors can also enjoy photo opportunities with Santa, Rudolph, and a giant sleigh. Holiday-themed tours of Ima Hogg’s historic mansion created by Todd Waite feature live actors, theatrical effects, and Christmas decorations.